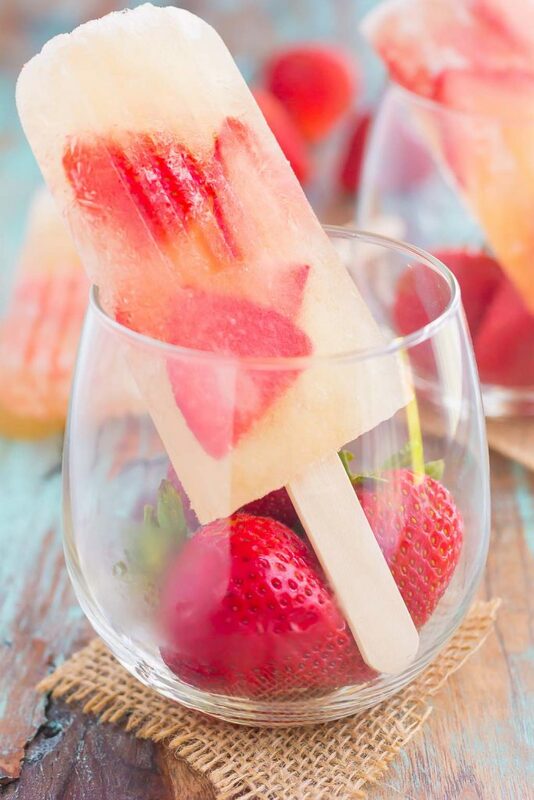 These Strawberry Champagne Pops are the perfect treat to beat the summer heat. 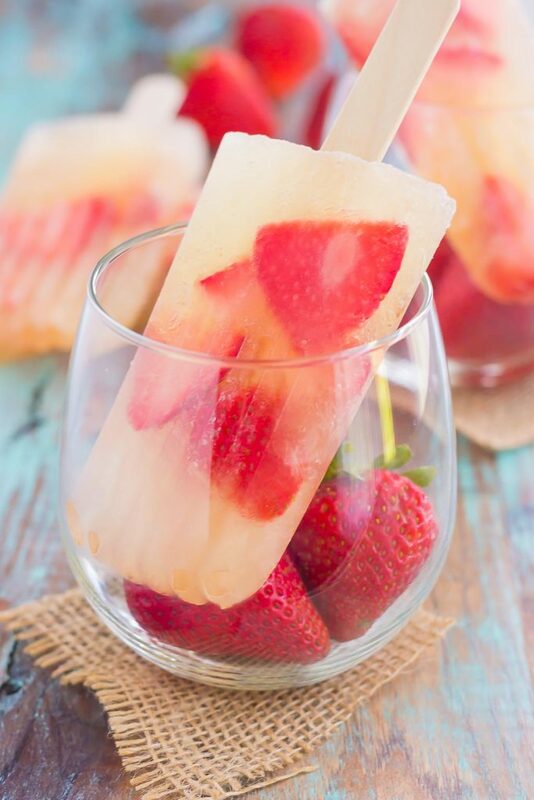 Filled with sweet champagne and fresh strawberries, these two ingredient pops are a delicious way to cool off all season long! It’s from one of his latest songs, ‘That’s What I Like’ and that’s where I got the recipe inspiration for these Strawberry Champagne Pops! I’m not really a big Bruno Mars fan, though I just couldn’t get those lyrics out of my head. He does have some catchy tunes, and this one just seemed to stick with me. 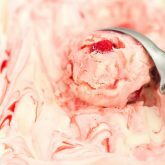 Since I kept singing about strawberry champagne, I thought a delicious summer recipe would be Strawberry Champagne Pops. Because champagne and strawberries go so well together. Plus, it’s summer, and we need ALL of the frozen treats that we can get our hands on, right? And what could be better than a two ingredient, cocktail treat? Not much if you ask me. Strawberries and champagne…they just go together so well, don’t they? Especially in frozen form. The crisp and refreshing champagne is equally as delicious when frozen. And the strawberries add the perfect amount of sweetness, and a pretty pop of color, too. And you just can’t beat easy pops for when it’s blazing hot outside! 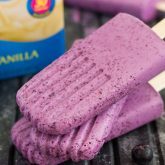 I’ve been making these Blueberry Cheesecake Pops and those Peanut Butter Pie Pops on repeat, so it was time to add another one to my rotation. How fun would these be to serve at your next party or summer gathering? 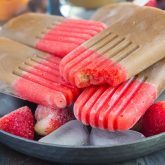 Sweet, refreshing, and packed with flavor, these easy Strawberry Champagne Pops will be a hit at your house all year long! Pour champagne into pop molds, filling halfway. Add several sliced strawberries to each pop mold and then fill with champagne to the top of the pop mold, if needed. Add pop sticks to each mold and freeze until solid, for at least 2-3 hours. I loooove me some Bruno Mars, and yes I know that sony, so I am totally digging the fact that his song inspired these pops! Popsicles are so fun, but champagne pops?!? Ummm all sorts of yaaahhss!! These look perfect, Gayle! I'll take a dozen. :) Pinned of course! Cheers, friend! Thanks for the pop love and pin, friend! Haha I totally have that song in my head, too! Thanks for the pop love and pin, friend! Happy Monday to you, too! These are so gorgeous, not to mention sound ridiculously refreshing!! Love this Gayle! Inspiration comes from the most interesting places sometimes right? :) I've caught myself singing along to that song many times..it is catchy! 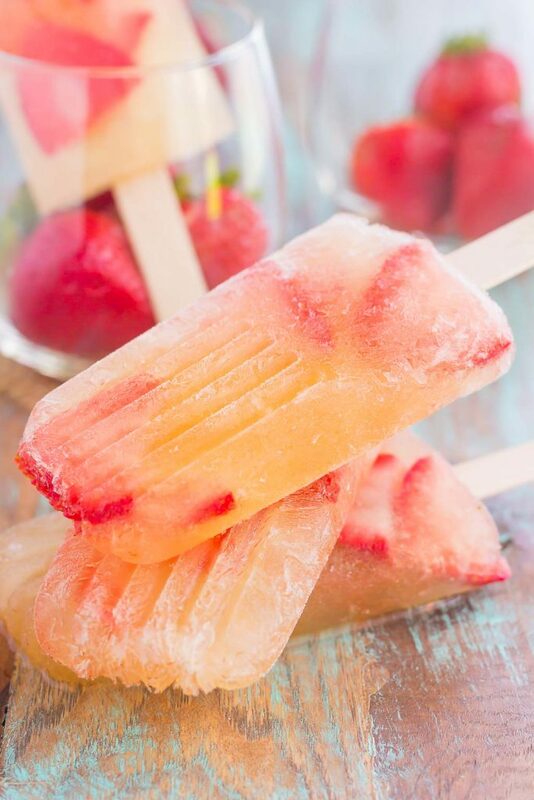 I would love these pops too -- frozen champagne with sweet strawberries would be such a refreshing delicious treat! Inspiration can definitely be interesting! :) Thanks, Marcie! Hah! That song is fun, and these pops look amazing! Such a great adult treat for a cookout! That song and these pops are SO fun, Gayle! It was so hot today and a few of these refreshing pops sound perfect for cooling down with! I know that song and I love it. These pops look amazing! 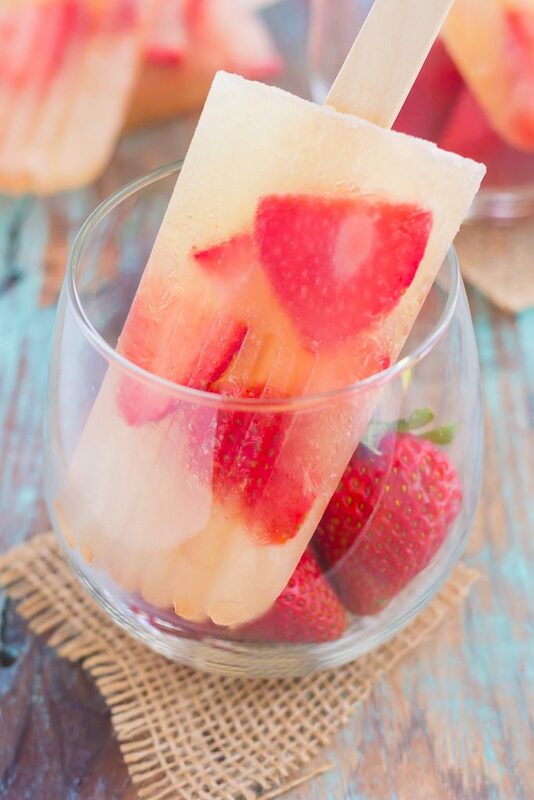 Never had champagne popsicles, but these need to happen soon. Perfect for today's weather! I'm not gonna lie, when I read the title of this post, that song was the first thought that entered my head! LOL. Seriously tho, these pops are GENIUS, Gayle! Love that you basically put a cocktail into popsicle form! Haha that song is catchy! :) Thanks, Sarah! 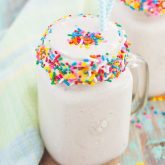 These are SO fun -- the perfect easy adult treat for those hot days! Definitely saving this one for next summer when I'm not pregnant. Lol! haha I love that these are inspired by a song!! 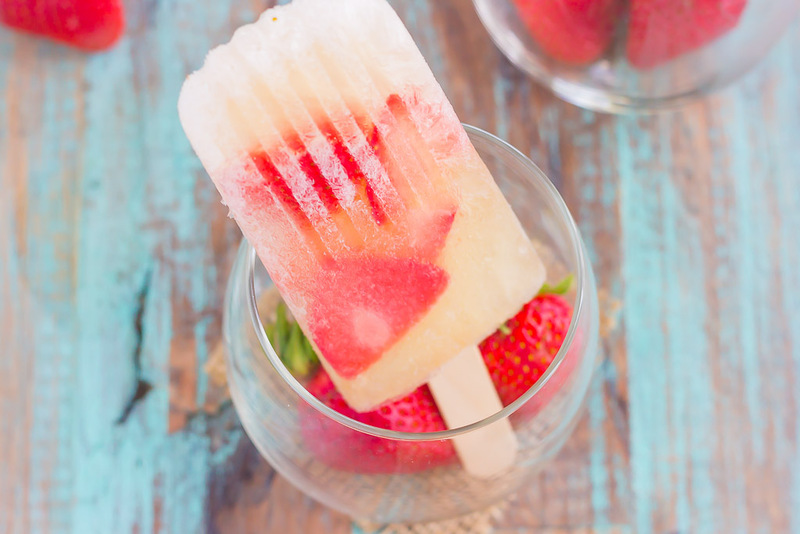 And I will definitely take some strawberry champagne pops to cool off this summer - so fun!! Oh my gosh - I always crank that song when I'm in the car or running... I too love the beat! And I love that that line was an inspiration for these pops! So clever! And delicious! Pinned! this looks so refreshing and perfect for summer! Thank you, Demeter! Isn't that song so catchy? !